Amish Wagon Works: Safety Boosting Additions for Your Speedway Express Wagon! Safety Boosting Additions for Your Speedway Express Wagon! Have your ever thought that you love your Speedway Express Wagon, but you wish you could make it a little safer for your young kids as they ride? Well, the Amish craftsmen at Speedway Express have made some wagon accessories that do just that! 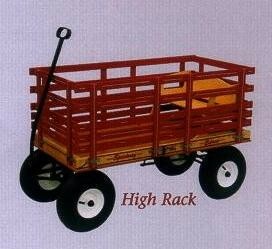 You can get High Racks for almost any model of wagon. The high racks could be just the thing to keep young children safe as they ride, and as a side benefit, you can carry larger loads when your are hauling stuff! Though we don't have a picture, for older kids there is a seatbelt that can be fitted to the wooden riding bench. It is easy to install, and will give you peace of mind as the kids play. We also have a wagon brake, which can be invaluable in slowing down fast moving wagons and keeping control while going downhill. We also carry a wagon brake for Valley Road Wagons.